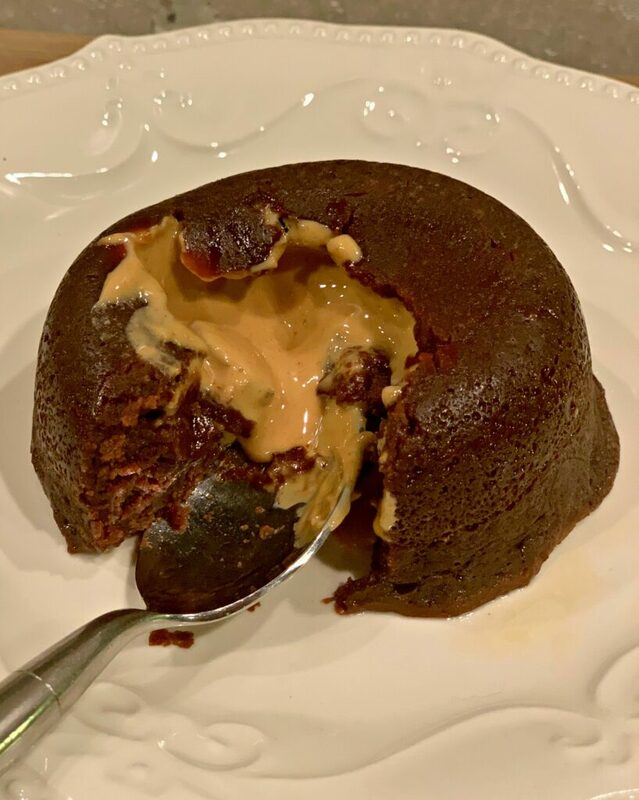 Instant Pot Chocolate Peanut Butter Lava Cakes combine two classic flavors into one delicious, mouth watering dessert! Calling all peanut butter lovers from around the world! 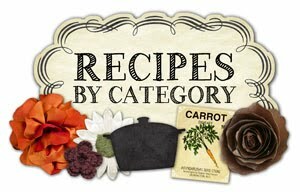 This is one recipe you do not want to pass up. As in….DO NOT PASS THIS ONE UP!! 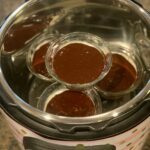 Don’t have an Instant Pot?? This may sway your thinking and cause you to want one ASAP! Last week, one of my kiddos was at a sleepover and it was down to my hubby, two kids, and I. If you have multiple kids, you know that even just taking one out of the mix changes the dynamic immediately. Suddenly, the two kids still at home are the best of friends and everything runs smoothly. It doesn’t matter which kids are left, happens every time, haha! Well, after my two finished playing outside, they came in and decided they were in the mood for a “special treat”. Their words, not mine. Since I too was in the mood for a dessert, I immediately went through my cabinets to see what we had. I found a bag of chocolate chips, my new container of peanut butter, and right then and there….I knew I needed to make something chocolate peanut butter! Chocolate peanut butter is hands down the best combination in the world. Well, combine that and the Instant Pot and its Heaven. 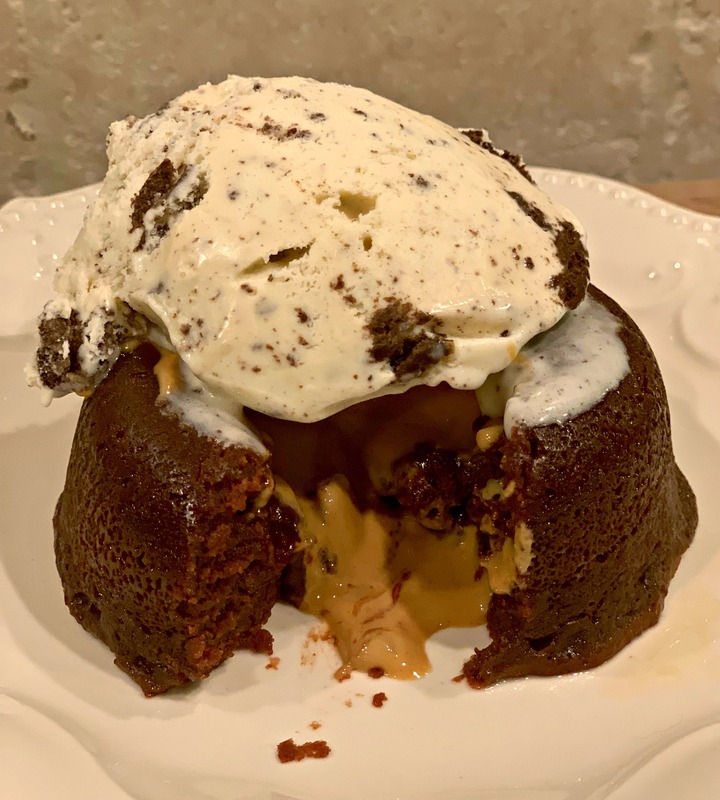 My daughter and I had been scrolling through Pinterest earlier in the day and came across an Instant Pot cake. 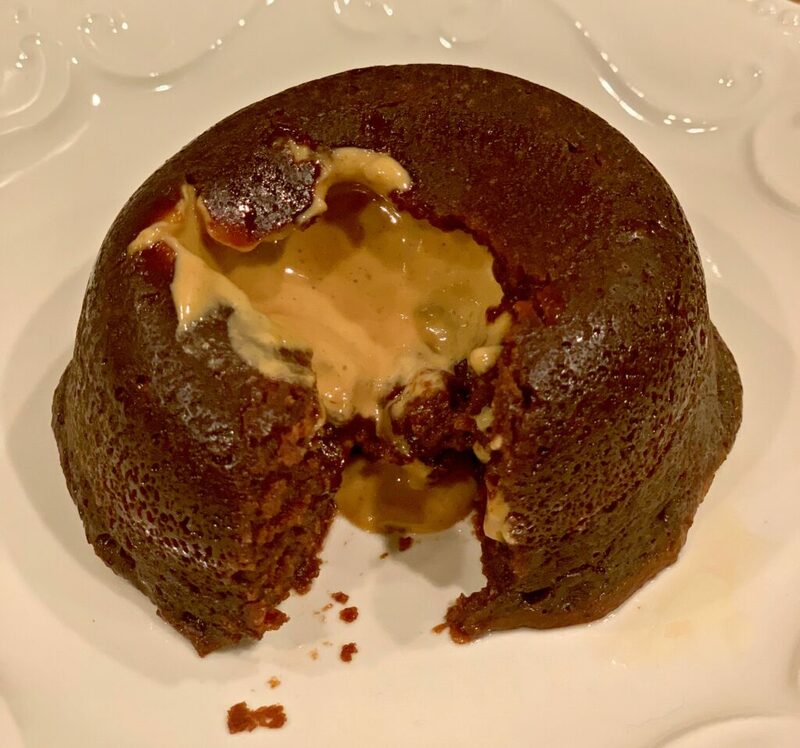 So, seeing the chocolate chips and peanut butter….we decided to play around with that recipe to make it our own! We had the cake batter ready to go in about 5 minutes! 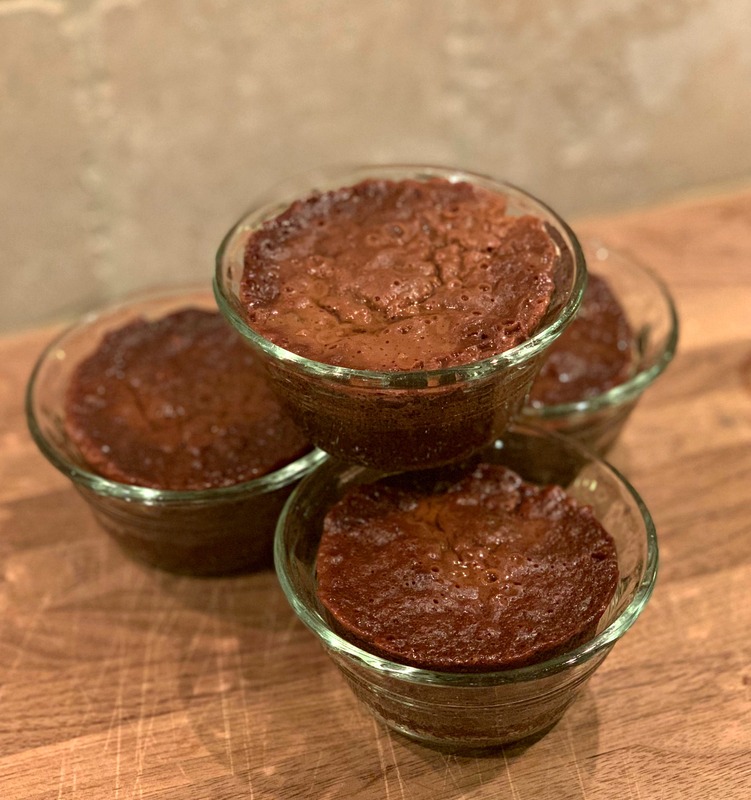 Placed the dishes carefully into the Instant Pot and a few short minutes later, they were ready to devour! 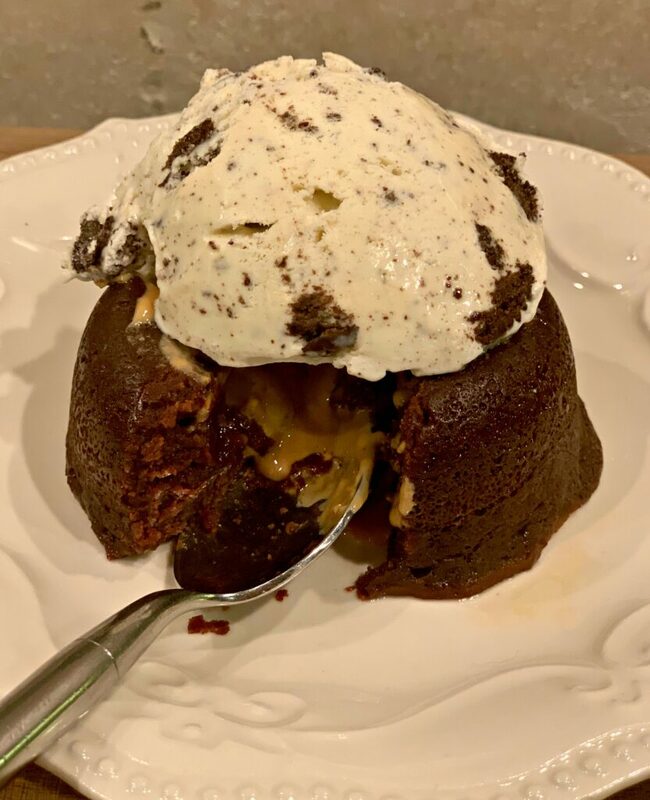 We each turned our cakes over onto the plate, placed a scoop of cookies and cream ice cream on top, and dug in! Creamy, chocolatey, peanut buttery, and pure bliss! No one spoke a word because we were all too busy enjoying our treat! I will warn you, these are almost dangerous. Why? Well, because they are so simple to prepare and quick to cook….you might find yourself making them frequently. If that happens, I can’t be blamed because I’m there with you doing the same thing and I warned you, haha! If you aren’t a peanut butter fan, simply omit from the recipe, but unless its because of an allergy….I highly recommend giving it a shot! Its incredible! Enjoy and let me know what you think! 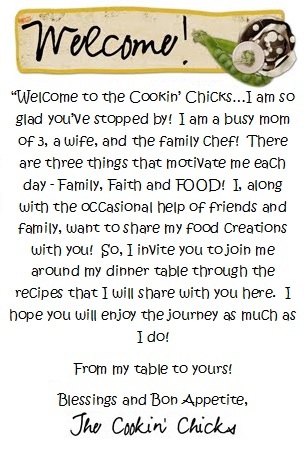 Share pics of your treats too using the hashtag #thecookinchicks on Instagram! *Be sure to sign up for my newsletter below! Pour the chocolate chips and butter into a microwave safe bowl. Microwave for 1 minute, stir, followed by 1 more minute. Once smooth and creamy, mix in the powdered sugar. Add in the eggs and egg yolk, stirring to combine. Pour in the vanilla and flour, stir well. Spray 4 glass containers (6 oz Pyrex bowls) with baking spray. Pour batter halfway up each bowl. Add a teaspoon of peanut butter to each bowl. Pour batter on top of the peanut butter, filling each bowl just about to the top. Pour 1 cup water onto bottom of Instant Pot and place trivet inside. Stack 3 bowls on bottom of Instant Pot, followed by 1 bowl in center on top. Cook manual high pressure for 9 minutes, followed by a quick release. Remove from Instant Pot and turn each bowl upside down onto a plate. 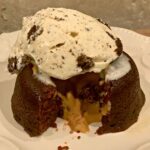 Serve with ice-cream, caramel, or chocolate sauce on top and enjoy immediately! This looks lovely, Ill forget abot the waistline. Haha, smart plan, but well worth the calories, I promise! Can I prepare the batter well in advance and cook it in IP when it’s time for dessert? Absolutely! I typically prepare it early afternoon, clean up and then cook it that evening. If you chill it, just allow it to sit out at room temp a bit before putting in the IP. Enjoy!